Our Vegbooks reviewers pooled our resources and came up with our go-to favorites that we’d gift to our friends and family if they were welcoming a new baby. 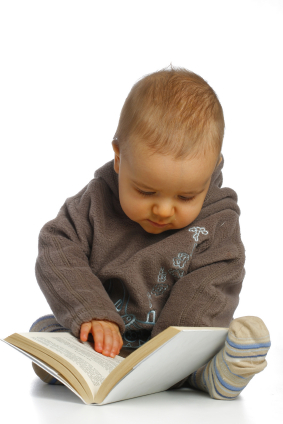 Since so many of our reviews cover the kid’s book side of things, we wanted to provide resources for the expecting family member. I know that I didn’t really get into vegetarian and vegan cooking and baking until I had children – before they came along eating out and quick frozen meals were my go-to staples. Enjoy these suggestions and feel free to share your own in the comments! 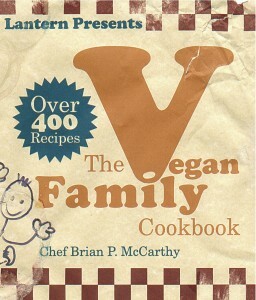 Cookbooks by Dreena Burton, including Vive le Vegan! : Simple, Delectable Recipes for the Everyday Vegan Family – From chickpea patties to soups and smoothies, this book has variety that families will enjoy. Nava Atlas’ cookbooks, including Vegan Holiday Kitchen and Vegan Express – Tradition and food are intertwined so families will appreciate getting a vegan spin on holiday flavors while Vegan Express helps families make meals when time is limited for preparation. Disease-Proof Your Child by Joel Fuhrman – A great book to bolster confidence in the face of the inevitable comments that may arise about raising a child with a vegetarian or vegan diet. Vegan Cupcakes Take Over the World by Isa Chandra Moskowitz and Terry Romero – You may wish to give this book earlier than the shower itself for ideas on treats to serve. Beautifully photographed with wonderful flavor combinations, now is the time to start a soon to be parent on a quest to be the best cupcake maker on the block. Vegan Family Meals by Ann Gentry – Another cookbook about cooking family sized portions, some recipes have new flavors while others are twists on old favorites like grilled cheese. The Vegan Family Cookbook by Brian P. McCarthy- Sometimes you need the basics and reviewers find that this cookbook includes great from savory stews and biscuits to sweeter fare. The Vegetarian Mother’s Cookbook by Cathe Olson – Recommended by several Vegbooks reviewers, this seemingly simple book has wonderful recipes for vegetarian families as well as extensive information and tips on eating vegetarian during pregnancy. Many recipes are easily adapted to a vegan diet as well. Peas and Thank You by Sarah Matheny – Beautifully photographed, this meatless family cookbook has great ideas including a recipe for healthy butternut squash fries. 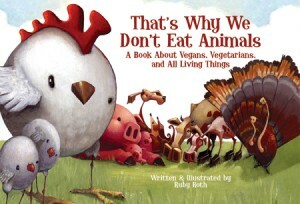 Vegan is Love and That’s Why We Don’t Eat Animals by Ruby Roth – While a new baby or very young child may not be ready for these books, they have received praise from Vegbooks reviewers as honest and forthright about the ethics of a veg lifestyle. For the veg expectant parent they would serve to help them frame an approach to communicating the hows and whys of being vegetarian or vegan to their children as they grow. Benji Bean Sprout Doesn’t Eat Meat – Though reviewer Jessica had some questions about this book, it does address being different as a child who doesn’t eat meat. For more ideas, check out this Baby Shower List from 2010. * Huyen MacMichael, Maureen McDowell, and Sandi Lancaster contributed. Please note that most links in this post are Amazon affiliate links, for which Vegbooks receives a small commission.